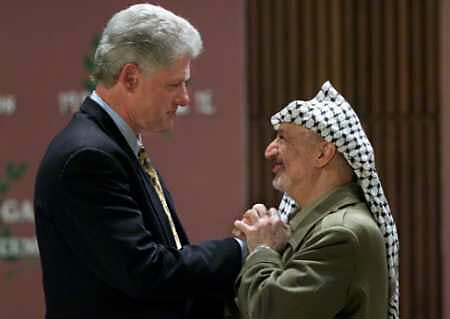 Yasser Arafat, ugly as ugly does, one of modern history’s worst human beings, surely the most murderous anti-semite since Hitler. 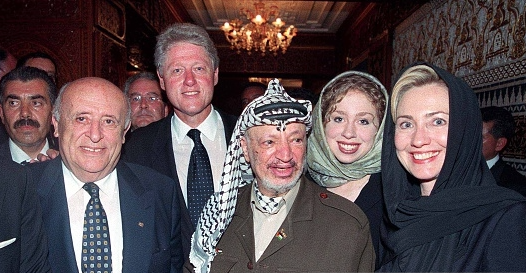 Yet during this monster’s blood-soaked stay on earth, he became a special favorite of the Clintons: lionized, honored, made respectable, even tearfully eulogized at death. No greater example exists of Orwell’s vision of DoubleSpeak/DoubleThink madness than this fetid avatar of modern terrorism: Nobel Peace Prize winner, vicious murderer. And like the Obamas and Clintons of this sorry world, another self-appointed champion of the Little People socking away stolen or extorted billions in a Swiss bank account. Because they can.